June 13, 1864—8.30 a. m.
This map* is from reconnaissance, one inch to a mile, and if laid on the printed one inch map, fitting it on at Moody’s house (top of map), will give you our present positions. I have two brigades out where the road comes from White Oak Swamp. The cavalry is in advance of that, and I hear artillery firing a little. I have no information from Wilson. The main portion of my corps is near my headquarters. General Wilson just sends me word he has driven their cavalry over the White Oak Swamp bridge, and that he and the enemy both fire artillery across. I live about where the N(for North) is. Very important item for tracking action of the 5th Corps to the Battle of Petersburg and siege. Is there word of who drew this? Is there an original? 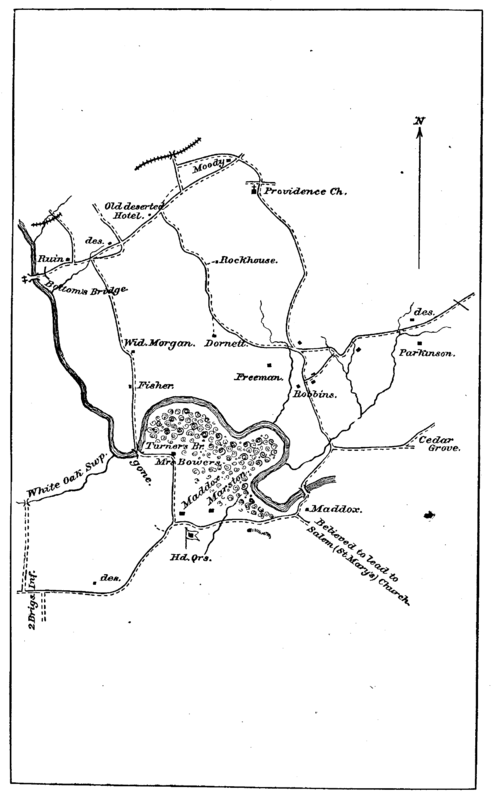 This map was drawn by someone with Gouverneur Warren on or about June 13, 1864. It is located in the Official Records, Vol XL, Part 2.